Aardman Animations was founded in 1972 by Peter Lord and David Sproxton. Joined by animator Nick Park in 1985, Aardman pioneered a quirky, lovable style of stop-motion animation and is behind a string of unforgettable award-winning hits including Chicken Run, the highest-grossing stop-animated film of all time, and the Wallace & Gromit series. 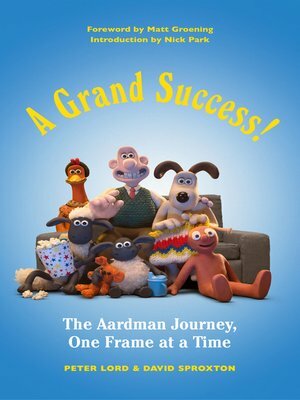 With A Grand Success!, Lord, Sproxton, and Park tell the inside story of the 45-year history of Aardman. From their first short films, made on a lark on their kitchen table, to advertisements and music videos, A Grand Success! recounts the adventures and challenges of developing their own unique style, growing their business, working with famous actors, and conquering Hollywood, all while animating at 24 painstaking moves per second. This is a charming and insightful must-read for all fans of animation. Nick Park is the writer, director, and animator who created Wallace & Gromit and Shaun the Sheep. Park has been nominated for six Academy Awards and has won four. Lord, Sproxton, and Park live in England. Peter Lord and David Sproxton are the founders of Aardman Animations. Lord has been nominated for three Academy Awards, including the award for Best Animated Feature for the 2012 film The Pirates!, which he directed.